The Today screen is a 'single swipe single glance' screen that's built right into your iPhone. And now - teamstuff is publishing your 'day at a glance' directly to it. And yes, it rocks. You can access it with a single swipe - from the top of your screen down - and it's even accessible whilst the phone is locked. It's a great iOS experience for accessing key information about your day quickly - and now it's got your all important sporting commitments right there. Since's it's a 'today' widget - we provide lots of simple information about the events you've got on today. Who needs to be where, by when. And if you need more information - click on the game details and the app will pop straight up, game details visible. OK, so how do you get it? Glad you asked - just follow these 3 easy steps. So swipe from the very, very top of your screen to get your Today Widget pulled down. Near the bottom of it - you'll see an Edit button, and you need to hit this. After hitting edit, you want to scroll towards the bottom of the Widget , and you'll see all the apps that support the Today Widget that you're not currently using. Apple wants you to opt in ( a very sensible policy we think ) so you need to tell your iPhone you'd like to us teamstuff. Just hit the green '+' icon near the Teamstuff entry. 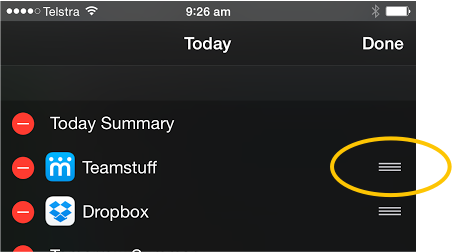 OK, now for the icing on the cake - getting teamstuff widget to display in the right order - which is at the top right? Flick to the top of the screen - you'll see the list of apps that you want publishing to your Today screen. Drag and drop the order of your wanted widgets by using the slide control on the right - and you're done. It really is super easy to do - and it's really, really useful!